Hiking to the roof of Phuket! Hiking is not a popular activity in Phuket. 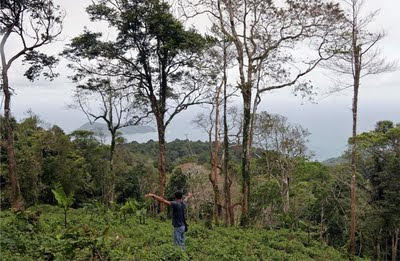 Yes, you have places where people go to exercise such as Suan Luang Park or Bang Wad Reservoir, but in general Phuket is not a hikers paradise. There are few footpaths, too much land is privately owned and .. it's really really hot most of the time! I had never given much thought to hiking up the hills in Phuket. Most of the big hills are accesible by road anyway (The Big Buddha and Radar Hill for example), although I was thinking of a hike up Buddha mountain for a while since a friend told me you can hike it from Karon Beach. I got more interested when I read a blog by an American expat who lives in Phuket. 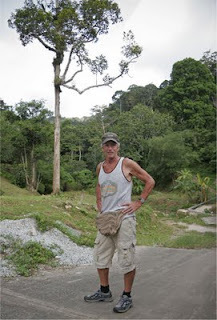 Glenn used to do lots of long distance hikes, and has been exploring the trails in the hills in Phuket. There are in fact more than I realised, many used by rubber plantation workers. 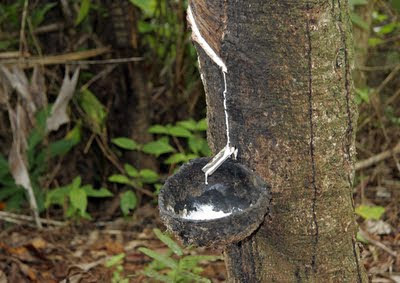 Rubber is still pretty big business here, most of the bigger hills are covered in rubber trees. 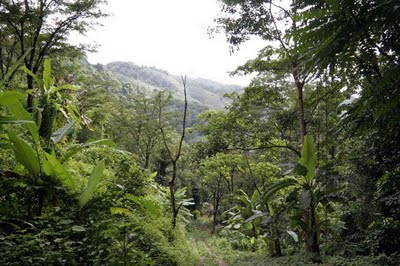 Glenn has been working on a "High Trail" through Phuket, connecting all the hilltops. He has written about this on his blog : Fiddlehead in Phuket. The start point, up a side road just before the waterfall, was just over 100m above sea level, meaning we had over 400m to climb vertically. Weather was good, rain had held off, but a bit more cloud cover would have been nice. The opening section of the trail was easy to follow and not too hard, but we then reached some very very steep sections, some was surfaced with concrete, some was dirt and rocks, some had water running down it. My legs did not like that steep section! I was soon drenched in sweat and had to take several little rest stops. Glenn would read off the altitude as we got higher. I think the opening half hour we climbed about 180m, and that was the hardest. I did think about abandoning, but the trail then got a little easier and my (ahem) "ex-athlete's" body maybe got used to the idea of hard exercise! Once the path flattened a little, I decided the top was a reachable target. Things became more enjoyable. The peace and quiet up in the hills is fantastic. 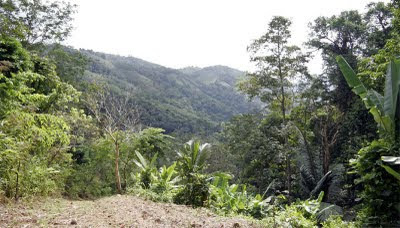 We did pass a couple of rubber plantation workers huts and saw a couple of workers, but otherwise, the mountain was ours. Not many places in Phuket where you can be quite so peaceful, and yet where we started the hike is only 4km as the crow flies from Patong Beach! We had a 10 minute rest at a cabin where Glenn had stopped before. The owner was not around, though. He has great views from his cabin over the east of Phuket. 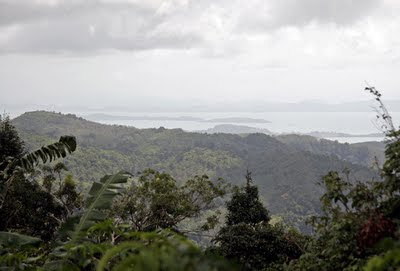 The photo below looks NE, you can see the Naka islands and Koh Yao Yai in the distance. Would be about 20km in a straight line to the islands. The path after the cabin was not so steep, but more overgrown. Not that far from the top, at around 470m altitude I think.. we lost the trail. 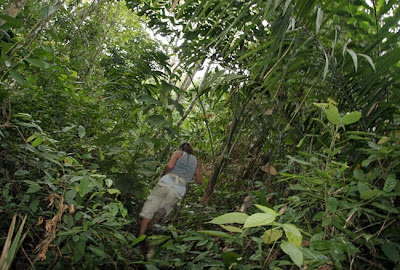 Although Glenn had been up a couple of times, it was before low season, and the jungle can grow quickly! We were close to giving it up, when Glenn had a "hey! how come I didn't see that before" moment and the path was found. I mean, it's not obvious, not a well trodden hikers path at all, just used by rubber workers. We passed lots of rubber trees which grow in among the jungly trees. It's green and wild up here. The rubber trees here are not in neat rows like in the plantations in parts of Phuket, must be hard work collecting rubber up in these hills. The last 40m of ascent were on a more open piece of land and we were surprised to find 2 guys working there, one of whom said he was the land owner and seemed to think we might want to buy the land. Well, views or no views, building regulations don't allow you to build a house at 400m above sea level! There is supposed to be a law in Phuket to prohibit building abover 80m, but ... No, unless you are a hermit, the roof of Phuket would not be an ideal spot to live. The views from the open land were great. Hard to get the feeling in a photo. 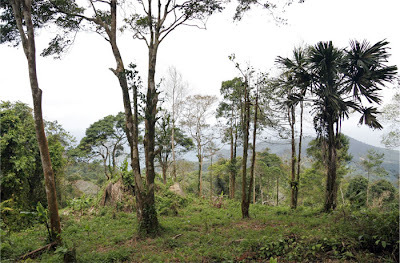 Lots of trees around, so you don't have unobscured views, but hey, this is 500m above sea level! The 2 guys had come up from Kalim beach (just north of Patong), by motorbike most of the way, they said. You can see a track on Google Earth leading to a point not too far from their land. Maybe try it that way next time! Now, Google Earth is a great tool, it even has an altitude reading, although it's not quite accurate. 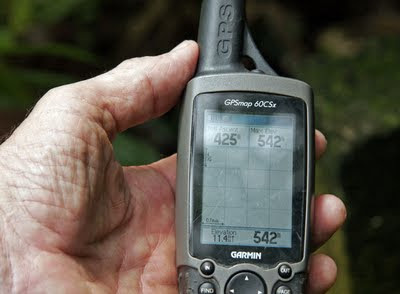 We topped out at 542 meters above sea level, though last time Glenn had recorded 545 meters. Updated Feb 2010 - check out the Hike Up to the Big Buddha! You have been reading ... Hiking to the roof of Phuket!